Some directors make six films a year, others only one. Few are those who make only one film every seven years. After his debut This Window is Yours (Kono Mado wa Kimi no Mono) in 1994, director Tomoyuki Furumaya disappeared from the world of cinema, seemingly vanished without a trace. He didn't re-emerge until 2000, when he served as assistant director to Shinji Aoyama on Eureka. But his real comeback he made a year later, returning to the director's chair to make his second film Bad Company. Competing in and winning the Rotterdam Film Festival's Tiger Awards Competition, as well as snatching the international critics' prize, Bad Company is easily one of the best Japanese films of 2001. This was more than enough reason for Midnight Eye to track down Tomoyuki Furumaya in Tokyo. In both your films you portray your protagonists as being very strong people, despite their young age. Creating strong protagonists is not really something I do consciously. But maybe it's a reflection of my own character, which is the complete opposite. I'm rather weak and passive, I take life as it comes and don't make an effort to decide my life for myself. So it probably comes from my admiration for people with a strong character. There's seven years separating This Window is Yours and Bad Company. Why did it take you so long to make your second film? Because I was negligent. I just passed the time doing nothing. If I told you that I wanted to make a film but couldn't, that would sound better. But actually I didn't have any intention of making a film. What was it that finally made you decide to make the second film? It's because the producer Takenori Sento gave me a good dressing down: "We have to do it now, you can't wait any longer." Making a movie is a lot of hard work and generally a big bother. So I think I was escaping from that burden during those seven years. I just spent my time working a part-time job in construction. If I would escape from making films, I would escape from life. I wanted to make films, but I didn't do it because I was afraid of the effort it requires. In that situation you develop a real self-loathing. Two years ago my producer pushed me to make another film and I finally started again. Then once I'd started I noticed that it was much more comfortable than being in my previous situation. Before I was constantly dealing with wishing that I could do what I wanted to do, which is to make films, and with not being able to do it because I was afraid of the hard work that comes along with it. Maybe I'm just a sissy. Now that you've made the second film, did you get over that feeling and that fear? After making Bad Company it was over. The feeling didn't come back. I really feel that I went through a very tough period and now I want to work on successive films. I have a project I'm working on now. But I went through a hermit period during which I didn't want to engage in social life. It's not normal to have that kind of sickness at age 33. Since you made the second film seven years after the first one, did the fact that you were older make it easier for you to handle the burden of filmmaking? On the first film I had to concentrate on the process, starting from gathering the crew and all the subsequent practical aspects of how to shoot a film. That practical side occupied me so much I couldn't think of anything else, including the artistic side of filmmaking. This was also because a large part of the crew consisted of friends who weren't very experienced. But the second time I could rely on the crew to take care of the practical aspects and I could concentrate on other things. So I had more peace of mind. In the press notes for Bad Company it said that you started this film by asking yourself the question "How could I have lived a better life?" Do you feel that you have lived a bad one? I think everyone goes through a low at some point in his or her life. My junior high school years were probably the hardest time I've had. Even if I had a time machine, I would never want to go back to that period. What's shown in the film is pretty much what I've lived through. Bad Company was the result of reflections about my junior high period and how I could have lived a more joyful high school life. What was lacking? The film came out of those reflections. How much of the situation in the film is exaggerated? Especially the teacher's humanity index seemed very extreme to me. It did happen that teachers would classify their pupils and label them. I noticed a funny thing while filming Bad Company. The child actors would often be negligent of their tasks and loiter around, so I needed to watch them. I would ask them "You came here because you wanted to play in a film, didn't you? So you have to have a positive attitude towards it." Then suddenly I noticed that I was repeating what my teacher said to me in school. Children are a bit like animals, you have to socialise them. But you don't realise that until you're no longer a child yourself. So now I understand both the feelings of the adult and those of the child. There seems to be a strong influence of the films of Stanley Kubrick on Bad Company. You yourself have mentioned that the relationship between the teacher and his students is a similar to the first half of Full Metal Jacket. But I felt that the film's plot and the development of the characters were very similar to A Clockwork Orange. I very intentionally wanted to redo Full Metal Jacket in Bad Company. I like Kubrick's films a lot, especially because of his constant use of two elements that are in conflict. Like the children and society in A Clockwork Orange, the computer and the astronauts in 2001, or the sergeant and the recruits in Full Metal Jacket. I feel Full Metal Jacket has a real elegance. Especially when the female Vietnamese soldier is killed and afterwards the soldier walk away singing that Mickey Mouse song. Kubrick would always go as far as he could. I can't go so far, and it also wasn't the film for going so far, so I didn't. And what about A Clockwork Orange? I like it, but I prefer Full Metal Jacket. For me, A Clockwork Orange is more romantic. Maybe it's because I saw Full Metal Jacket as an adolescent and A Clockwork Orange later. So Full Metal Jacket made a more direct impression and had a stronger influence on me. There is a scene in Bad Company where the boys have been punished at school and their fathers come to pick them up at night. You shot those four men entering the schoolyard, lit from the back. It's very similar to the scene at the start of A Clockwork Orange, when the four guys enter the tunnel to beat up the bum. Both scenes are backlit and the characters cast long shadows over the ground. That wasn't an intentional reference. It's only now that you say it that I realise the two are similar. Actually, during shooting we thought it was reminiscent of Close Encounters of the Third Kind and we really had to laugh. That kind of light doesn't exist in the middle of the night, it's very unrealistic, but we decided to use it anyway. There were similarities in the society portrayed in Bad Company and that in Battle Royale. The latter shows the system of discipline you show in Bad Company taken to perhaps its absolute extreme. I haven't seen Battle Royale. There's only one death in Bad Company. If it's true that fifty people die in Battle Royale, and I managed to say the same things with only one character dying, then I think I did pretty well. Bad Company seemed to say that being a delinquent was the only way for the characters to achieve freedom. It's difficult to say. Delinquent behaviour is only effective if there is a society you are clearly against. If you have a father who doesn't hit you no matter what you do, then if you're a delinquent it's difficult to be a delinquent towards him. In a way, the children in the film also want to be restrained, in a sense. Maybe restrained with love from their parents. 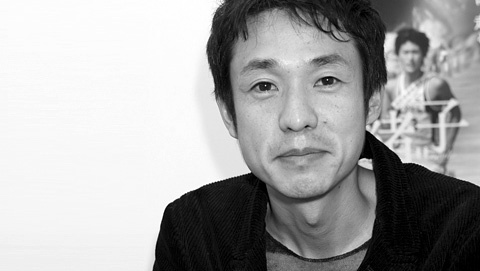 At the end of the film it is said that the protagonist Sadatomo grew up to become a manga artist. You yourself became a filmmaker. Do you believe that for an adult, creativity is a way to achieve freedom? I like Stephen King's Stand By Me a lot, the novel rather than the film. The ending is similar to that of Bad Company, except that all characters die aside from the protagonist. They went on an adventure to search for a dead body, and by going through that adventure they became adults. But once they were adults, they died. To me, it seems that the author says that it isn't so easy to become an adult - to become an adult simply by passing an initiation no longer holds true. To think so is fruitless. If you manage to escape from that way of thinking, then you are free to tell your own stories. So in a way creativity does equal freedom, yes. How did you find the young lead actor, Yamato Okitsu, and what made you choose him? He is a professional child actor and I found him through an audition. Aside from him, all the children in the film are non-professionals. Okitsu had a real audacity, he was a bit like the childhood version of Shintaro Katsu. He was always himself, no matter which lines of dialogue he read. Have the non-professional kids continued acting since Bad Company? Actually no. During the shooting I asked the children what they wanted to be when they grew up. The smallest boy said he wanted to be a bus driver, and the other an athlete. So neither of them has continued acting. Do you intend to continue focusing on teenagers with your next film? No, it's a story about guys my age, set in the city. You won two prizes with Bad Company at the Rotterdam Film Festival. Did that have any effect on how the film was received in Japan? It was released in Japan many months after it showed in Rotterdam. Maybe it was better than nothing, but I feel that there wasn't much of a reaction. Somebody told me it wasn't reported very widely in the Japanese press that the film won those prizes, so people probably didn't even know it. Before becoming a filmmaker, you studied law for a while after leaving high school. Was that an example of you falling victim to the conformity described in Bad Company? Were you always a professional otaku? It's just the kind of choices you make in life. I always wanted to make films, so I wasn't in any rush to become a lawyer. I thought maybe I could combine those things. To be a lawyer / director (laughs). I was in university, so I had to choose a subject. At which point did you decide to pursue filmmaking? Very quickly. As soon as I realised that the subject I'd chosen wasn't interesting I decided to quit. My grandfather was a carpenter, he made furniture. Just before I entered university, he made a bookcase for me. But it was made of very heavy wood, so when my father and I tried to pick it up to move it, I hurt my back rather badly. When classes started, my back was really bothering me. That, combined with the fact that the classes weren't very interesting, made me quickly decide to quit university. My back didn't really get better either, but the doctor said I wasn't really sick anymore, and that my problems were the result of my mental state. It was just an excuse not to go to university. So when I quit school, my back improved very quickly. At that point I tried to concentrate on making films. Like I said earlier, I was always good at trying to escape from things that I think are difficult.